Quickie Ten with Nicola Haken + Spotlight on Saving Amy + BIG Contest! Oh Oh! *sigh* I absolutely positively love Saving Amy! I don’t often read angsty stories and I don’t think I’ve ever read one quite like this… But I couldn’t put it down! Nicola Haken’s storytelling pulled me into Amy’s head and heart and I was cheering for her and I needed her to find a safe place. Soooo I had to invited Nicola to Tartlandia to chat about Saving Amy and then (cause I’m me 😛 ) I had to ask her silly questions. She’s a darling and I want to keep her for my own. Meet Nicola and add Saving Amy to your TBR pile! Me: Nicola! Oh hon! I’m so happy you came by to visit- From England! <g> Take a seat on my comfy red couch. (It’s velvet!) and lets chat for a bit… I know you must be crazy busy with the release of your third novel, Take My Hand, in October. And we’ll get to that in a minute but I wanna talk about Saving Amy. Nicola: Ooo you’re right, it is comfy 😉 Thank you for having me! Me: I just read Saving Amy. In one sitting no less. *sigh*. I loved it…. I don’t think I’ve ever read a book like it before… It’s painful and raw and beautifully hopeful. You made me cry! *grabs another chocolate chip cookie* Did you cry a bit writing Amy’s journey? Nicola: Absolutely. When I’m writing I AM that character and I think and feel everything they do. My books play out like movies in my head (naturally, I’m the star!) and I can literally see the story playing out (seeing things that aren’t there is totally normal right?). It’s hard not to feel the emotion when I’m right there with the characters. Sometimes my bottom lip is wobbling away while I’m tapping on the keyboard and I’m just grateful no one can see me because I must look pretty damn ridiculous! Me : Like I said hon, I loved Saving Amy and I’m so glad I read it. September is Suicide Prevention month and I appreciated that your story isn’t preachy or book thumpy it just feels honest and acknowledges that there aren’t easy fixes but there is always hope… Tell me about writing Saving Amy please. Nicola: Saving Amy was certainly a tough story to write – probably because it’s so intense. Although I like writing angsty stories with hard-hitting issues, I usually start off pretty light and work my way up to it. However I dove straight in there with this one. There was no time for lightheartedness or humour – almost immediately you are dragged into the horrors of Amy’s life. As with all my characters there are elements of myself hidden within them and also some of my own experiences. It can be very easy to judge people in Amy’s situation, especially those who may self harm or consider suicide and I suppose I just wanted to highlight that for some, they see no other way. Amy isn’t weak or selfish… she’s simply lost – exhausted. To her the pain she inflicts upon her own body is a welcome distraction from the greater pain she feels inside. Amy’s cutting, drug taking and sleeping around are not attempts to end it all (at least not initially)… they are very much about trying to feel alive. Trying to feel anything at all. I hope Amy also proved however, that no matter how bleak things are or how dark your thoughts may go, there is always hope. As my nanna used to say – nothing lasts forever. There IS help out there. There ARE people who can help you. Unfortunately for some however, the wait is just too long and painful. Wow, enough of the serious already… where the hell are those cookies????? Soooo You have another book birthday coming up… Take My Hand is the first in your new series. Tell me about it and ummm *blush* I get a bit confused sometimes with labels… Do you consider your books New Adult? Nicola: I should be the one blushing – I’m an author and still get confused with labels and genres! The only thing I’m pretty certain of is that they’re not sci-fi 😀 So yes I would class my books as New Adult/Contemporary – purely because the main characters fit into the right age group for that category. Still, I’m not sure if that’s the ‘right’ category… but it’s the only one you’re getting! So, Take My Hand… It’s book one in my first ever series and I’m soooo excited about it! Written in alternating POV’s it follows the story of Dexter and Emily. Dexter has moved to the UK to build a new life for himself. He’s a bit of a grumpy sod who keeps himself to himself and has no interest in making friends and definitely not lovers. But hey, I wasn’t having any of that… so I threw Emily into the mix and watched him struggle to keep away from her! Me: Done! I added it 🙂 *points up* It sounds like angsty goodness. I want! I can’t wait to see the cover reveal on the 23rd! Thank you for putting up with my questions… *bounces on the couch* It’s about to get worse… or better! Ha! These are silly questions that I NEED to know the answer to. 1. Are you a good dancer? When I’m alone – hell yeah! 2. What’s your favorite pizza topping? 3. What’s your favorite TV commercial or jingle? I’m wearing a purple t-shirt with a snow tiger wearing sunglasses on it (cool huh?) and some white pajama bottoms with pink spots on. Hey, don’t judge me – it’s Sunday afternoon! 6. What’s the last thing you took a picture of? Books and Barbie’s! Books are a no brainer. I read as much as I write. As for Barbie, I’ve loved her for as long as I can remember. I’ve got literally hundreds of dolls from my childhood packed away and now I collect the special holiday editions. Yes I know I’m a grown up (or so I’m told) but it’s cool because I don’t take them out of their boxes – I just look at them. So that’s totally not weird… is it?! 8. What is the last movie you saw in a theater? I’m SO jealous! I wanna see it! 9. What’s the cleverest word you know? Onomatopoeia. It’s one of the spellings I remember being drummed into us at school, and then me feeling like a total smartarse for learning it super quickly! 10. If you were in a band, what instrument/role would you play? The singer – star of the stage! You should see me bopping along to my iPod – I totally OWN that hairbrush! Me: Awww you rock Sweetie. Thank you again for hanging out with me at The Book Tart. Please come visit again… maybe bring Curly Wurly candy! I can’t find it easily in the states and it’s delicious. Nicola: I ALWAYS have Curly Wurly’s in my cupboard. Mainly because, not only are they uber delicious, but because I follow the weight watchers plan and they’re only 3PP! Me: Oh! make sure to scroll down and enter the BIG giveaway! Enter Richard Lewis – the doctor responsible for saving Amy’s life after her drink and drug-fuelled suicide attempt. Thanks to his own hidden demons, Richard is drawn to Amy and her situation, and despite the incessant warnings from both his own mind and his jealous ex-lover Joanna, he feels compelled to help her. But how will Amy feel when she discovers Richard’s attachment to her is born out of his own guilt? He was her last resort – her last chance at being saved. Can anybody save Amy, or has she finally reached the end of a very long, torturous road? I live in Rochdale, England with my wonderful family. 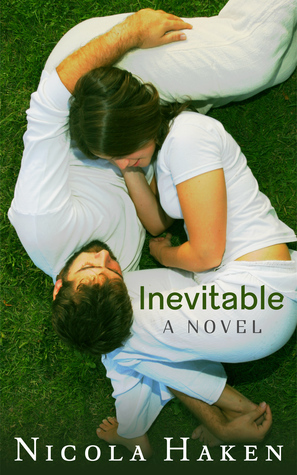 I have two novels under my belt (Inevitable and Saving Amy) and have just finished writing Take My Hand – book 1 in a 3 part series – which will be released in October. When I’m not playing with my imaginary friends I can usually be found looking after my four adorable (sometimes!) children (five if you include the dog, six if you include the hubby!) or studying towards my English Literature degree. All in all I’m just an ordinary mum with an addiction to reading about hot book guys, writing about hot book guys and Pepsi Max! If I was in a band I would play the tambourine. It can’t be that difficult can it?? The last movie I saw in a theater was the new Star Trek. Wow what I great looking series! I love your two covers, and I can’t wait to see the new one! Pepperoni. I have to have cheese and pepperoni or it’s not a pie! I love pizza! My favorite topping would be pepperoni! Love the interview. Favorite pizza topping – I love barbecue chicken pizza! Thanks for having a giveaway! Favorite pizza topping is pepperoni! Love the interview!! Thanks for the giveaway!! FAVORITE PIZZA TOPPING IS SHRIMP. THANKS FOR THE GIVEAWAY! What’s the last thing you took a picture of? One of my dogs, a Chinese Crested. My favorite pizza topping is pepperoni and mushroom. Thanks for the fantastic giveaway! If I was in a band, I would definitely play the bass guitar. There is something about it that just makes me all tingly inside. Thanks for the giveaway! If I was in a band I’d be the drummer!! My favorite pizza topping would have to be green peppers! I’m wearing a Hoodie from the college I went to and Sweatpants from a college I didn’t go to. I know, hot. My favorite pizza topping is Banana Peppers with Peppersoni, throw some onion on the pizza too and you have a perfect pizza. Previous PostPrevious Book Blitz After The Fall by L.G. Castillo + Excerpt + Contest! Next PostNext Mina Khan’s Wildfire Spotlight + Excerpt + Contest!